Before I launch into this month’s article, I thought I’d mention that this is a good time of year to give your loom(s) a bit of a cleaning and tune-up. I give my looms a quick vacuum or wipe down as I notice fuzz build up, but it is nice to go over your loom with a soft cloth (I like microfiber cloths as they trap the dust) and get into all of the nooks and crannies a couple of times a year (or more). Tighten all of the screws, and give it a once over to look for any other issues. Schacht looms are built to last, but caring for your loom will help it continue to look beautiful and function well. For some time now, I have had the urge to weave with something less like yarn and more like thread. I have several cones of very fine linen in my stash, and every once in a while I’ll pick one up and imagine what it would look like woven into cloth. Then I weigh the number of ends to measure and warp in one hand and the management of a highly active two-year-old in the other hand, and the two-year-old wins. Though perhaps the two-year-old has been an excuse to avoid doing something that seemed a bit intimidating. I also have a thing for handkerchiefs. I find using a handkerchief infinitely more pleasing, not to mention less abrasive, than a tissue, and many in my collection have sentimental, in addition to practical, value. EBay and etsy.com are both great places to find vintage handkerchiefs, and they can be had starting at less than a dollar. My mother-in-law recently gave me a lovely handkerchief that belonged to my husband’s great- grandmother, and it has her initial beautifully embroidered in the corner. I will probably refrain from using this to wipe the aforementioned two-year-old’s nose, and will save it for a special occasion. So I got to thinking. A handkerchief isn’t all that large. What if I were to weave a handkerchief? The wheels began to turn, and then next thing I knew I had easily justified winding all 690 ends of a four-yard warp. I decided to start with the source of my inspiration and take a closer look at the handkerchiefs in my collection. I took measurements and counted the ends per inch. The latter task was made easier thanks to a 4x magnifying loupe, a small ruler, and a pin. Looking at a magnified view of one inch of the handkerchief, I used the pin to mark each thread as it was counted so that I wouldn’t lose my place. I did this with several of the handkerchiefs in my collection to come up with an average. The number of threads varied from 70 to 90 ends per inch. I wanted to make a handkerchief I could use for everyday use – one that would hold up to the abuse a two-year-old might send its way and not mind being crammed into a bag next to the container of cheddar bunnies. This meant experimenting with a closer sett. I opted for 60 ends per inch. I knew this would be a bit denser than your average handkerchief, but decided that was an okay place to begin my fine thread experiment. I was aiming for a 10.5” x 10.5” finished product. This meant hems at the two cut edges. All of my finer handkerchiefs have rolled hems around four edges, but with a humbler linen in mind, two seemed acceptable. Also, it seemed to me that a denser cloth would produce a bulkier hem, which I wanted to avoid. I calculated my warp requirements based on an 11.5” width on the loom at 60 ends per inch for a total of 690 ends. After selecting a cone of linen singles that met my sett requirement, I placed the cone on my lazy kate (note: if you are not a spinner, you can approximate this set-up with a long knitting needle and a shoe box). The general consensus seems to be that allowing the yarn to come off the cone horizontally helps to avoid adding twist. Linen can be challenging due to its inelasticity, and even tension is crucial for a good warp. I recently came across a wonderful suggestion on Weavolution made by Halcyon of Halcyon Yarn, who suggested threading your warp through a tube and holding the tube rather than the yarn while winding the warp. Clever! I ended up with something akin to a paper cut along the edge of the finger I used to guide the yarn onto the warping board. This tip might have saved my finger and helped create even tension in the warp in one fell swoop. I’m a front to back warper. Even though the general consensus seems to be that warping back to front with linen is preferable, I didn’t have any issues with this warp. I sleyed three ends per dent in a 20-dent reed. Schacht has a nice warp sett reed substitution chart if you need any guidance on how best to distribute the threads in your selected reed. Be sure to check that you have enough heddles on the shafts you are using before you start the warping process. You don’t want to be messing around moving heddles with 690 ends mid-warp. I was in a constant state of toddler alert until I was all tied on. This was a simple plain weave like all of handkerchiefs in my collection. 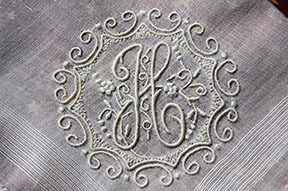 I have not added detail, but am considering adding some basic embroidery – perhaps initials or something whimsical. As I wove the sample, I was concerned that the cloth was going to be too dense. I forgot one of the few rules of weaving I like to follow, “It’s not finished until its wet finished.” I wove enough for a single handkerchief and stopped. I am a believer in experimenting on the fly, so I decided to lower my sett from 60 ends per inch to 50. Removing the warp and starting over wasn’t really an option. Oh the tangled mess! So I checked the reed substitution chart, and for 50 ends per inch with a 20 dent reed I needed to resley 2-3-2-3-2-3 and so on. I got out my trusty dusty magnifying glasses, cut the woven cloth from the loom, and started to remove one thread from every other dent in my reed. Are you cringing yet? To be honest, it was kind of liberating. I then pulled these threads out of the heddles, bundled them together at the back of my loom, and tied on my new 50epi warp. At this point you might be asking about my threading sequence. I’d like to say I thought long and hard about what to do, but really I just decided to go with what I had. The point was just to get an idea of how cloth at that sett with that yarn might feel; to experiment, if you will. As I wove, the cloth began to look almost like gauze. Now as much as I am a handkerchief person, I am even more of a scarf person, and the cloth on my loom was starting to look like a summer scarf option. Since it was no longer plain weave, it began to show some interesting striping where warp threads were crammed together. It felt a bit crunchy, but I was hoping that laundering the cloth would remedy that to some degree. So how does this all wash out? Well, I now have a summer scarf about 10.5” x 85” in a nice gauzy linen, and I have a 10.5” x 10.5” toddler-proof handkerchief that is what I envision to be first in a long line of handkerchief experimentation. I learned that warping 690 ends takes a lot less time than I thought, and the end result is quite satisfying. I think I will try the handkerchief experiment with cotton to see if I can create a more refined product, but in the meantime, I have a perfectly serviceable, albeit somewhat rustic, linen handkerchief. Yarn for warp and weft: Linen from my stash that is similar or perhaps slightly finer than 70/2 linen, 240 yards. inch. I did not overfill my bobbins, and at the suggestion of my Master Weaver friend Diane Howes, I wrapped my wound bobbins in damp towels to improve the attitude of the linen before weaving. I machine stitched the cut edges of both pieces before washing in a regular cycle in my front-loading washing machine. I will admit that before washing the fabric, I was not optimistic. There truly is magic in the water, as Laura Fry puts it. After drying, both pieces were pressed. I like to use a separate spray bottle when pressing linen so that I can evenly dampen the fabric. My handkerchief fabric was a bit too rustic for a tidy rolled hem, so I made the tiniest fold I could manage with my hands, and hand stitched it in place. Before stitching, I used my rotary cutter to remove the frayed edge so that the fold would be clean. I still have to remove the machine stitching from my scarf. I think I’ll snip and pick it out and let the frayed edge serve as the finished edge. It seems fused enough to hold its own, and I like the raw look. Before sending the sample off to Jane, I twisted it onto itself, similar to creating a skein of yarn, so that the fabric would acquire a wrinkled je ne sais quoi sort of finish!